I'm so grateful to wewe. 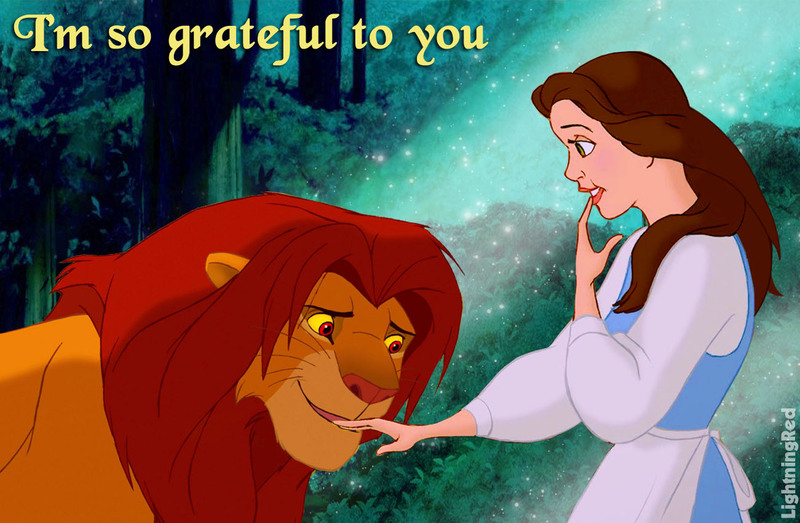 After Belle helps Simba, he feels grateful to her and he licks her hand. Surprised but pleased, Belle realizes that he is kind and polite, so she is not afraid of him anymore. (adapted from The Wounded Lion). HD Wallpaper and background images in the Disney crossover club tagged: disney crossover belle beauty and the beast simba wounded lion king i'm so grateful to you lick. How did you get rid of Belle's bow? Just draw new hair over it and erase. ^Well, Thomas has red hair like Simba's mane, but I've made a story of him and Ariel. Will people be bored of seeing him in another story made recently too? My first thought of who will be the prince is Eric. ^I won't be bored of seeing him. I think Thomas or Eric would be a good match. Thomas especially. I think I'll use Eric.